Retirement Visa / Monthly Deposit into a Thai Bank. I think I've boxed myself into a corner here. Any suggestions as to how to rectify my situation would be greatly appreciated. I'm 55. I've had a retirement visa for five years now. [I used the US Embassy Income statements to satisfy Thai Immigration] My Retirement Visa expires on August 08, 2019. I have an annuity with a US bank but they will not deposit into a foreign bank. 1. Set up a Bangkok Bank Account here in Bangkok and have it linked to a direct deposit account at the Bangkok Bank New York Branch. 2. Do you think this will work? 3. 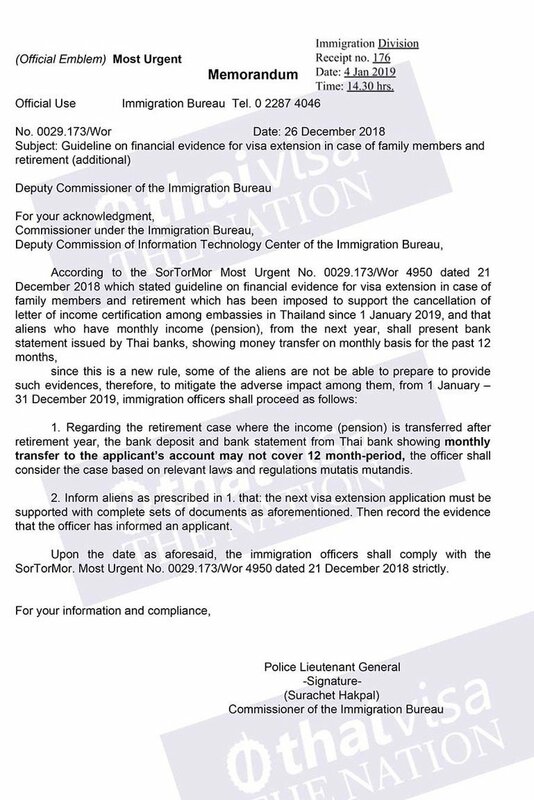 Does Thai immigration even recognize the monthly Bangkok Bank New York branch Direct Deposits as a legitimate way of showing the monthly minimum guaranteed income in order to keep my retirement visa. It will be about 80K per month. this will affect my visa renewal. Will I be forced to go the 800K route because I didn't have the transfers going for the previous 12 months? Or will there be some lenience as they implement these new procedures. 5. When is the cut off day to have the 800,000 baht in a Thai Bank? ---Visa Expires on August 8th, 2019-- 90 days prior to my visa expiration date?? And do we know exactly what the 800K requirements are in terms of how long they can't be touched? I'm just a mug. Not expert. Here is what I plan. Put the 800k into a Thai bank. Some say 2 month before some say 3. Play it safe. 3. Keep untouched for next 3 month. Then not below 400k till your next extension. Personally given risk if messing up dates, I'm putting 800+ into term deposit and leaving it. Extensions simple till Thai imm next bull#### rule change. Thinking some folk are overlooking income method problems. Rogue imm offices to name one. So many threads about transfer wise, mainly USA folk. Don't be surprised if imm want other "stuff", such as pension letter from home country etc. Play it safe if you can afford it. 3. Does Thai immigration even recognize the monthly Bangkok Bank New York branch Direct Deposits as a legitimate way of showing the monthly minimum guaranteed income in order to keep my retir﻿ement visa. It will be about 80K per month. According to the new rules it’s 2 months, but I suggest you plan for 3 if you can. You need to keep minimum balances of 800K for 3 months after the extension starts, 2 months before the next renewal, and 400K during the months in between. If you want to use the income method just have your annuity paid into your US account and make monthly transfers yourself to a Thai bank account. That should be accepted; however, immigration might want proof of the source of the income. 2/3 months of transfers should be enough prior to the 2019 extension application. Elvia...just a hypothetical. If you were currently on extensions based on retirement, what method would you use. In particular, not embassy letter available and no "pension" or government letter from farang land confirming social security etc, available. Just relying on bank statements alone? i believe this method goes away as of april 1st, if you mean doing a domestic transfer from your bank to bkk new york. only options would be a swift or one of the money xfer services. Clearly the simplest way forward is to deposit 800K in the bank, forget about it, and use it solely for immigration purpose. If it turns out that immigration only want to see monthly transfers my preference would be to leave the capital in my home country and transfer 65K pm to Thailand. I don’t like needlessly tying money up. It would have to be direct deposit account set up at Bangklok Bank branch here. You cannot have an account at the branch in New York. A direct deposit account can only be set up for certain pension funds such as Social security. And after April 1st the transfers must be in the IAT form. It may be too late to start making monthly transfers of 65,000 at this point unless you are prepared to "start over" (leave, re-enter on a visa exemption, transition to a 90 day then begin to extend that). Hence this may be why most are recommending the 800,000 approach. But then you could get six months (Mar-Aug) in, which may be enough to satisfy the "leniency" clause. Not sure where you came up with 6 months for the "leniency" clause. There is no set number for it. In theory a person would only need 2 or 3 months of transfers if they were being lenient. Since the rules state only one transfer is needed for a new application it is even possible a office would accept that for a extension done this year. I "came up" with the six-months because this seems like the greatest number of months that the OP could squeeze in. It was specific to his/her situation, this being March already. I'd like to think that one transfer will be satisfactory for a new Extension, or even two or three for a second++ Extension, but until we start to see reports it may be best to keep everyone grounded. Exactly. I couldn't have said it better. It is only for this year. In the future it will have to be a full year for all extensions after the first one. The problem for this year is that many people may not even be aware they cannot get proof of income from their embassy this year until they try to get one (that has already happened). Perhaps accidentally include a copy of the directive in your income based extension of stay documents? I already have a copy of the original and the translation of it. Can you provide a copy of the official Thai version please.